Notice of material connection: I received a copy of this book from The Speakeasy in exchange for an unbiased review. As always everywhere, my opinions are my very own. 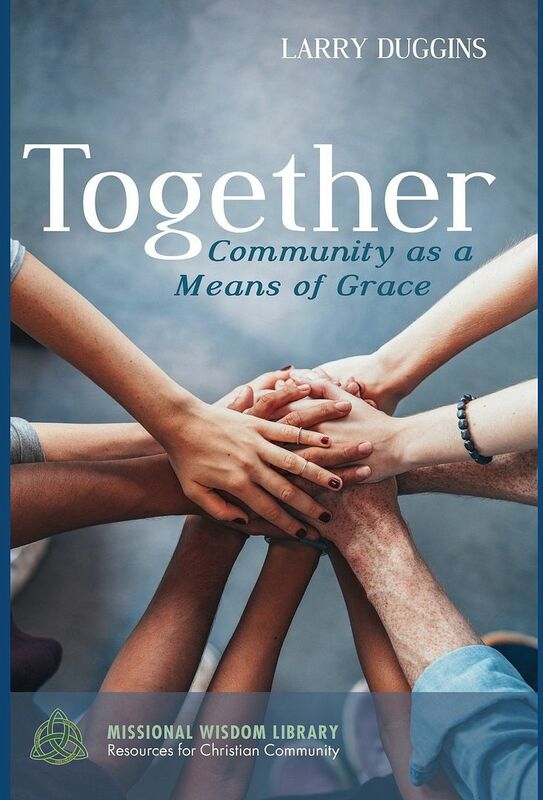 Larry Duggins, Together: Community as a Means of Grace on Amazon. Author Larry Duggins is co-founder and Executive Director of the Missional Wisdom Foundation. Missional wisdom?! Missio / mittere = send. In the power of the Holy Spirit of Pentecost, God sends all of us out into the world to proclaim the gospeled good news. Wisdom = knowledge, discernment, insight. Everyone may be sent, but is everyone wise? In the church we affirm God's grace frequently comes to us through tangible, earthbound, physical "means" rather than nebulous, free-floating spiritual currents. In the Reformation traditions we refer to (Preaching (and reading) of the) Word and Sacraments as ordinary means of grace. The Westminster Catechism describes sacraments as "sensible," or accessible via our five physical senses. Duggins writes Together from a Wesleyan perspective that distinguishes instituted and prudential means of grace. Instituted would refer to the dominical sacraments or ordinances of baptism and the Lord's Supper we celebrate because Jesus commanded or instituted them them; in addition, they employ stuff of creation, and are available to all people. John Wesley being the well-ordered, methodical guy he was, thought through and more-or-less codified many aspects of life you might call sacramental if not technically a sacrament—not far at all from Martin Luther's insistence we find God hidden yet apparent in, with, and under the commonest, most mundane activities and things that became a means or a vehicle of grace. From page 22: "...prudential means of grace includes activities and actions that lead to interactions with God's grace that are not directly attributable to examples from the life of Jesus." In the church we confess grace came to earth in a unique way through God's embodiment or incarnation in the human Jesus of Nazareth. By definition, Christianity is incarnational, celebrating God's presence on earth, in a body, in Jesus of Nazareth and also in the church he founded that bears his name. Together leads to community that leads to God's presence and action in unique ways that otherwise would not happen. Community: "a group of people gathered together under some unifying principle or for some particular purpose" (page 28). The book's basic premise is look around, use your imagination and you'll discover ways grace, hope, and life are making inroads into previously unhappy and unpromising settings. Use your imagination! Your church, school, or other organization may be able to renovate and restore an unused room or space that in its turn and time will help restore and renovate lives. But as important as a place to meet can be, it's not only about physical locations. It's about wisely perceiving the needs to receive and needs to contribute of people in your midst. You get the idea! Together the book is packed with real-life ideas and examples the author knows have worked. It's short and not theologically overwhelming, so it even could help a church outsider realize how down to earth and real-world Christians and Christianity can be. I often explain sacraments as models that help us recognize God's everyday activity in everyday lives and events. In the power of the Spirit of Pentecost, ideas in Larry Duggins' small book can help all of us – wise or not – become a part of community whose everyday, ordinary body together becomes holy in the world, for the world. That's incarnation! That's God with us!